Thanks for clearing that up Mich. So the dashed line from the river trail directly east to Willard is paved. (Willard is a dirt road.) The one north to Mt. Hope Cemetery is dirt and has a huge oak tree that fell over it but the route is passable if you can step up a couple feet. This berm where the dirt path (dashed line running north/south) to the cemetery holds some sewer piped buried underneath. I think this is where the stakes for the new pipe through Scott Woods terminate on the east side. Yeah, there are ATVs that rode on this parcel, glad to see this parcel become part of the park. LAN, just to be clear, but can you access the pond in Soldan Dog Park from the paved trail between the River Trail and Willard? The map is showing an unpaved pathway going south from the east-west pathway, but I'm curious if this actually existing? I guess what I'm curious about is that for folks who access the park and River Trail from Willard on the east or Clifton on the west by foot, can they access Soldan Dog Park without the key fob/having to pay kind of like how you can access Hawk Island by foot from the River Trail without having to pay? Good question. Disappointingly you cannot access the dog park from Willard/River Trail, with or without a fob. That red dashed line to the river trail is blocked by a fence. To enter the dog park you have to walk along the river trail to the two other entrances at SW corner or the SE corner of the dog park which is by the tubing hill. I don't know if this long walk counts as defensive planning but I think it is to get you to pay to park at Hawk Island. It makes the dog park less of a neighborhood park in my opinion. It is just hard to get to from walking from Aurelius. There are no parking signs posted on Willard and Ruth. I would really like a second entrance along Willard or Ruth but do not really know who to go about asking. The dog park is not free and it does not appear to be over-subscribed with users. Thanks. I didn't figure you could access it from a back way, as that'd defeat the purpose of having it controlled accessed from Hawk Island, but I figured I'd ask. I don't even have a dog, but was curious with how this whole area is set up. BTW, people can claim hardship and not have to pay for parking at Hawk Island, though, I imagine it works on a case-by-case basis and depends on how busy the park is on any given day. Mayor Andy responded to a letter I wrote to him about Scott Woods, which was very nice. He said that what they are replacing is a "force main sewer" which is under pressure. It is 60 years old [60 is not that old!} and is at the end of its usefulness. They have identified 50 trees of around 6 inches in diameter and 12 trees of 18 inches or more that will need to be removed. 62 trees in all and he said that over half of those trees are dead. They will be replacing those trees with "local flora" to return the area to woodlands. While one could argue that they should find another route for the sewer line, after hearing from the Mayor I feel better and more informed about what is going to happen. It seems like they are going to try to minimize the damage to the woods. We'll see. Thanks for the digging on this! 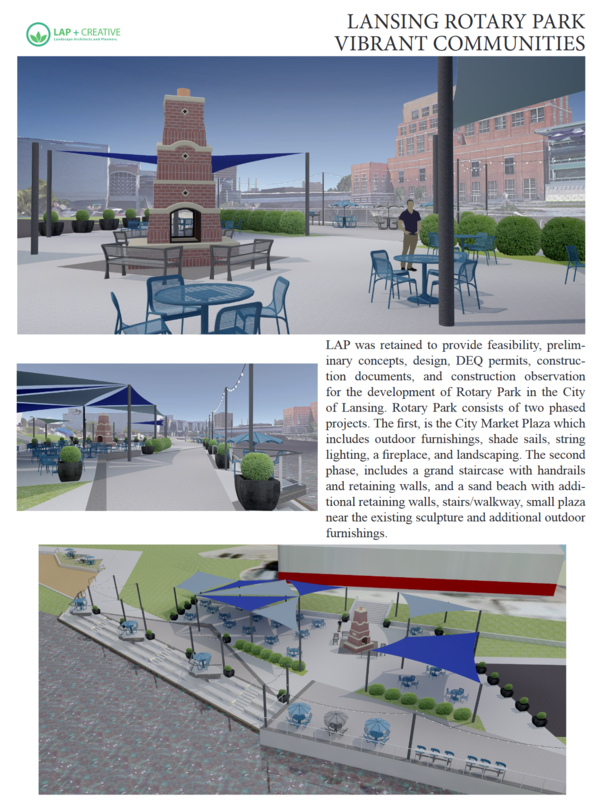 I wish one of these renderings would focus on an area of the park besides the food court. It's been discussed here, but without public restroom facilities and some sort of attraction, I just don't see this getting much use. I REALLY hope I'm wrong, but this just looks like a mirror image of the river front adjacent to the Lansing Center. If I'm down there, I'll step out for some fresh air, but I'd never think of it as a destination. As you had mentioned earlier - at least some grills or something. I am looking at this as a start. Maybe like building a stage that has yet to find a show. We will have to see what is going to fill all of the seats in this part of the park. The fireplace looks better than the East Lansing fireplace, it will have to actually used for fires to be more successful than that one. I am a bit skeptical of the sand beach plan in the center of the city. It could become an expensive kitty/goose litter box and a draw for vermin, this will require a lot of maintenance to keep it clean attractive and safe. I think a grass beach like at Lake Lansing may be a better option. It seems like a good firm is in charge of the plan so I am hopeful it will be a success. They have some really nice plans on the page linked above. Not many will (or should) get in the water until we stop draining our sewage in to the Grand River. The LSJ had an article recently about how just a little amount of rain causes our combined sewer system to overflow in to the Red Cedar and Grand rivers. I generally try to keep pretty current on things, but even I was shocked by that article. I thought we'd made huge strides with the CSO seperation projects since the 90's, even thought we were a model for the state. Turns out, the sewers overflow more (in raw volume) than just about any other city in the state save Detroit, a city many, many times larger and older. I was really hoping in the story that they would have had a list of the worst inceptors; they say the worst area is between the two dams, but I want to know the biggest offenders in terms of overflow locations.